Tonifies kidney yang, warms mingmen fire, nourishes kidney yin, nourishes blood, benefits jing, strengthens tendon and bone. For involuntary passage of urine and urinary diseases. Strengthen kidneys. For weak kidneys, impotence, urinary problems, urorrhagia, neurasthenia, rheumatic pain, numbness. This classical formula dates back to the Ming dynasty, and is considered one of the two most important prescriptions for tonifying kidney Yang. 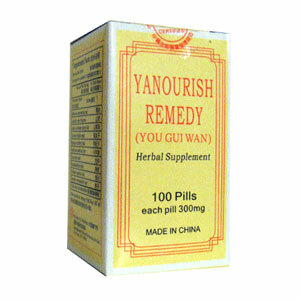 It supports kidney Yang and Yin, thereby strengthening kidney Qi. Tonifies kidney yang, warms mingmen fire, nourishes kidney yin, nourishes blood, benefits jing, strengthens tendon and bone. Use for chronic deficiency of kidney Qi and yang causing lower back pain or weakness, weak knees, and urinary dysfunction. Also useful for yang deficiency causing male impotence, female infertility, cold limbs, edema, poor digestion, and loose stools. A good general tonic for aged patients and following illness. Can be taken for long periods of time. Take 6 to 8 pills, 3 times a day. Discontinue use during colds and flu, as tonics tend to drive pathogenic factors into the interior. Not to be used during pregnancy.